Get up here! 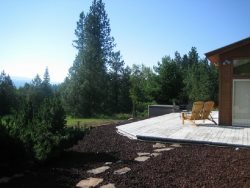 This fantastic custom home is surrounded by trees, very private and has access to miles of riding or sledding from the Scriver Creek Trail Head. With 5 separate bedrooms, everyone has a spot. This split-level home boasts a beautiful prow front with lots of windows. Natural light floods the main living area, dining area and kitchen. Along with the master bedroom and bath, there is another quiet bedroom and 1/2 bath tucked away behind the kitchen.. Step up a level and there are two private bedrooms and a full bath. Head up to the loft for family play time and sleeping for kids or extras in the two twins and full bed. With central air and wood heat this cabin stays cozy, whatever the weather! Enjoy the privacy, views and nature while dining on the patio or sitting around the fire pit. Plenty of parking for your toys. Stay in touch with WIFI and watch your favorites with the new Smart TV! You and your team were AWESOME!!! The team was very helpful through the whole process. We had some questions and everyone was answered quickly. The cabin was wonderful. Easy to get to and a lovely view. Super clean and a great floor plan. My wife can not climb stairs very well and the majority of the cabin is on the main floor. Plenty of room to go on walks. Only 15 min to Starlight Mountain Theater. Our family has been renting cabins for years and this was the easiest company to work with and nicest cabin we have stayed in. We will probably rent it again. The staff at Idaho Vacation Rentals were amazing. We had some difficult timelines and they worked around our schedules. They went above and beyond. Thank you so much! We loved the property. It was beautiful!